We started our meeting off with a mid-build clean. Swept and vacuumed up the entire lab and reorganized tools. 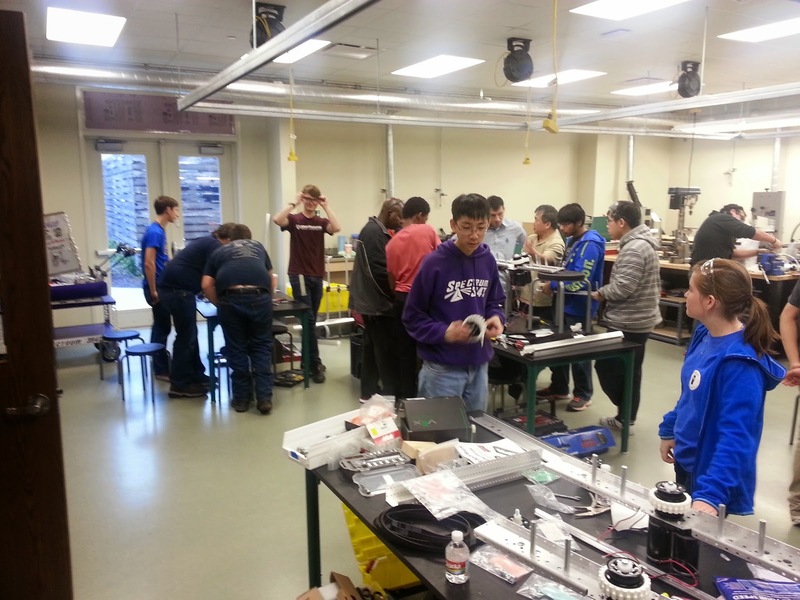 We are running our router non-stop during meetings to get our competition robot drilled and ready for powder coat next week. We found out our sheet metal parts should be delivered from Solarcraft on Friday, which is very exciting. A weekend of non-stop riveting is ahead of us. We'll be able to get most of our production testing done quickly. 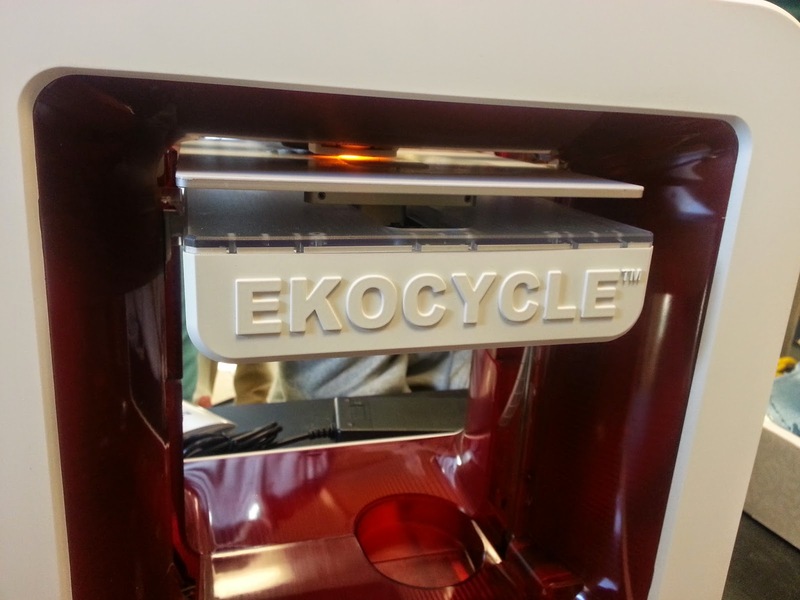 We are using our Ekocycle printer to make thank you gifts for our sheet metal sponsors. Short post today. We got the complete prototype drive train working. Please note the pneumatic is just for the real robot will be much smaller. That's just what we had lying around that would work for our goals. We tested this briefly on our practice bot form last year and saw that the concept works. It works a bit better on this robot. The gyro should be able to do the steering for us and keep us moving straight sideways during autonomous and when adjusting for stacks. This week we will be getting the tower and supports made and hopefully have this robot stacking totes by the weekend. We had a busy day of CAD and routing parts. Today was the first real day of riveting as well. 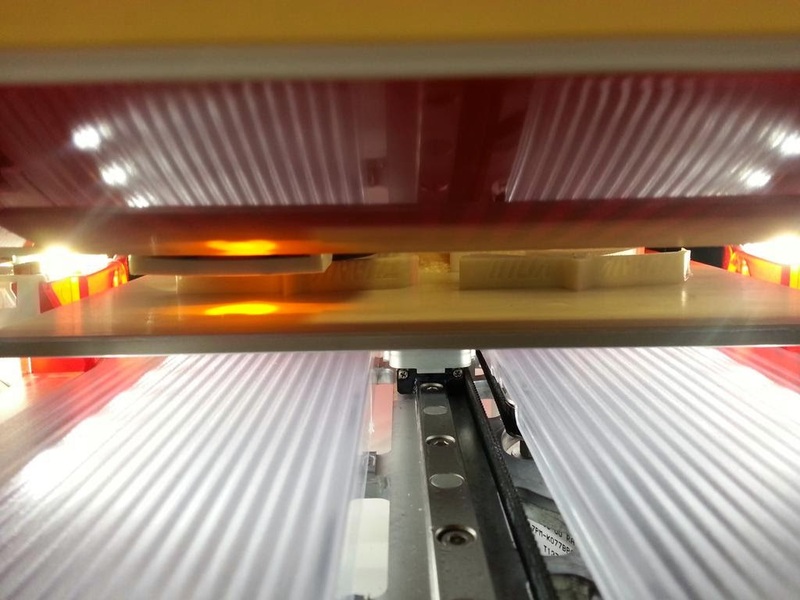 We've been making a ton of gussets on the Zenbot CNC router and they all need to get riveted to the robot. 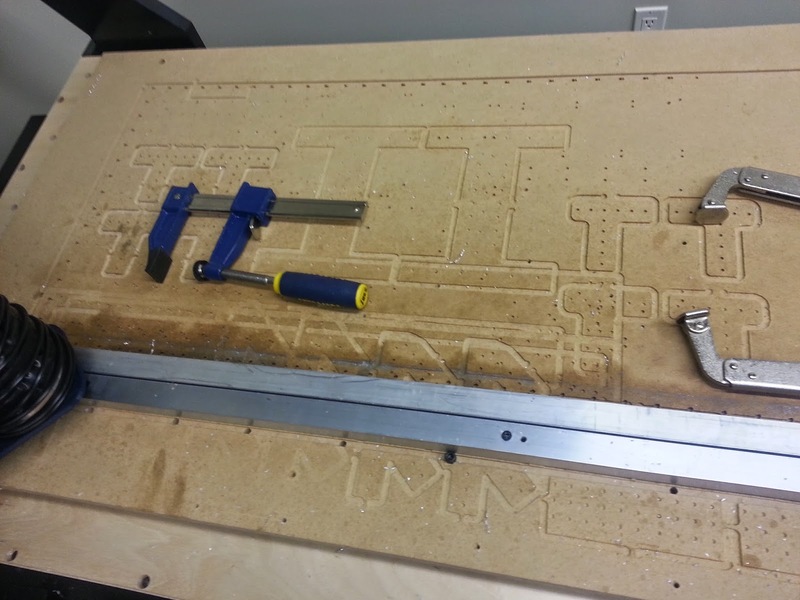 Here is a picture of our belly pan with all the mounting holes piloted by the router. 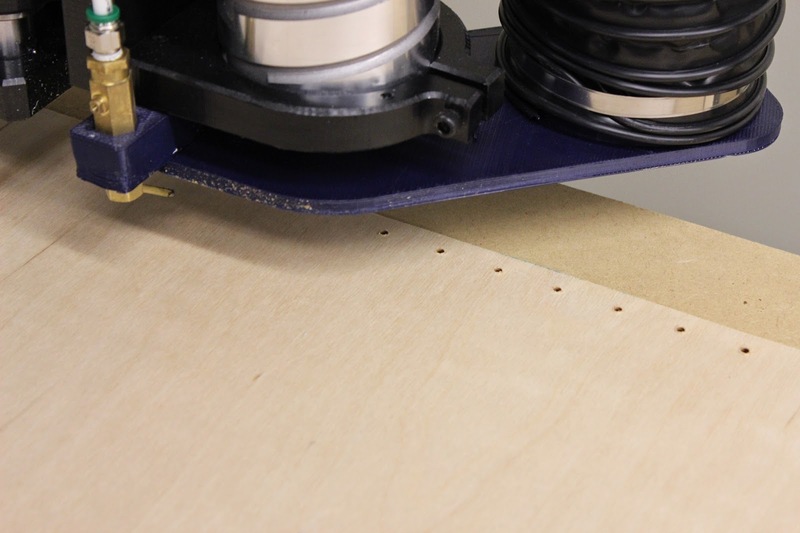 Right now we can only drill 1/8" or 1/4" holes with the router since we only have collets for those sizes. We use the 1/8" bit to pilot all our holes then match drill them to 3/16 for rivets or 13/64 for #10-24 bolts when we go to mount them. We'll finish mounting the belly pan on Sunday and get started on mounting and wiring the electronics. We should be driving soon. Our recycling container grabber mechanism is now finding it's way into CAD to make a more production ready unit. We really started getting into the construction of our versaframe based chassis today. 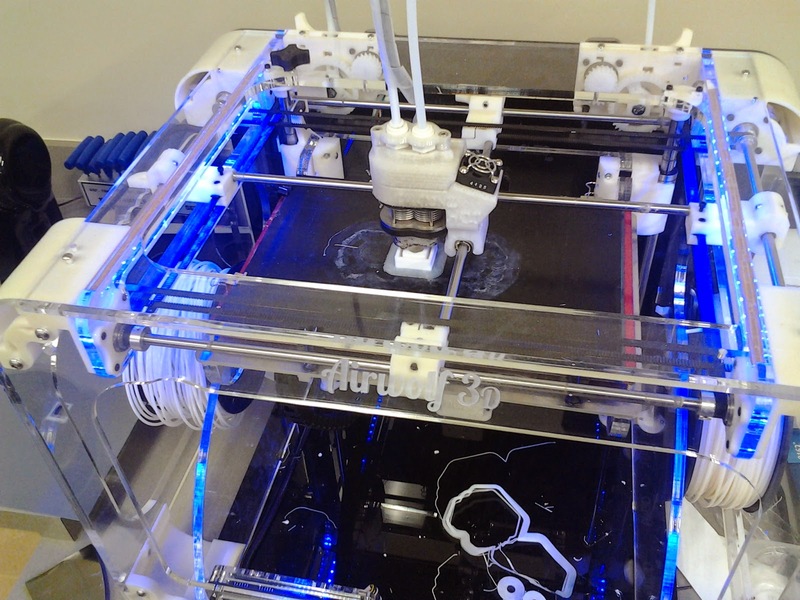 Many of the parts we are 3D printing or CNC routing for the prototype to make sure we like everything before we purchase some of the pieces. The above image shows some of the cutouts we have made from a sheet of ABS, it cuts very nicely and it's fast for prototyping and test fitting. We've built up both our drive rails and we'll have them chained up and hopefully assembled tomorrow. We have to cut a few more gussets and make a few more mounts but we should have something driving sometime on Sunday. 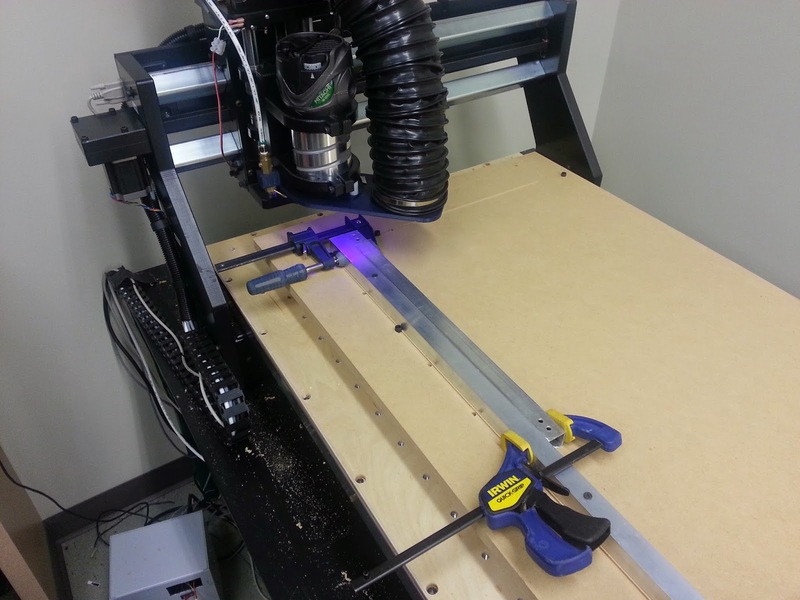 The versachassis system has been very easy to get started with. Something simple for a drive base will make our robot really reliable. We're planning to add an H-drive colson wheel that we should be able to mount fully over the weekend as well. One of our special projects this season has been the tape measure based recycling container hook system. We've been iterating on it and working to make sure we can quickly acquire a few of the containers. Today we added a spool and string to allow for a stronger pull back. 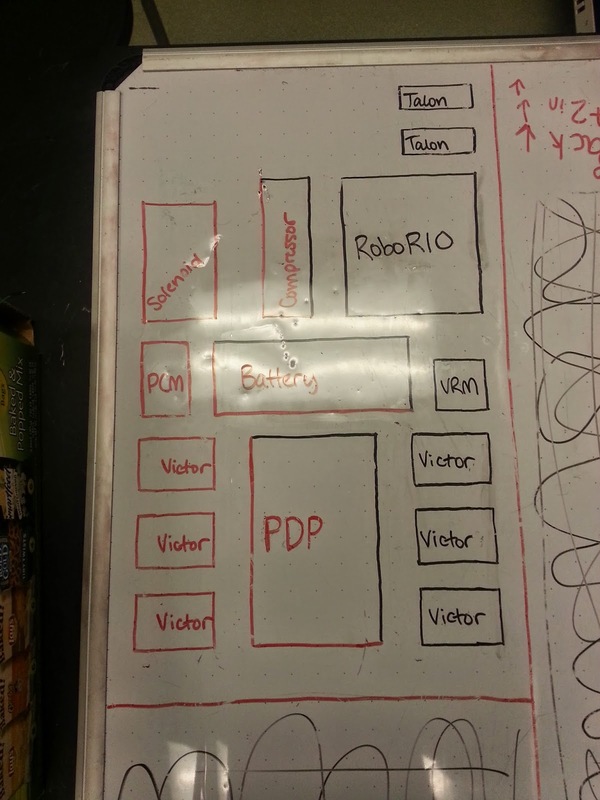 We are almost finished with our electronics layout in Solidworks and we'll be putting that on the router in tomorrow afternoon to mount to our test chassis. Tomorrow we have our friends the Discobots working with us in our shop. 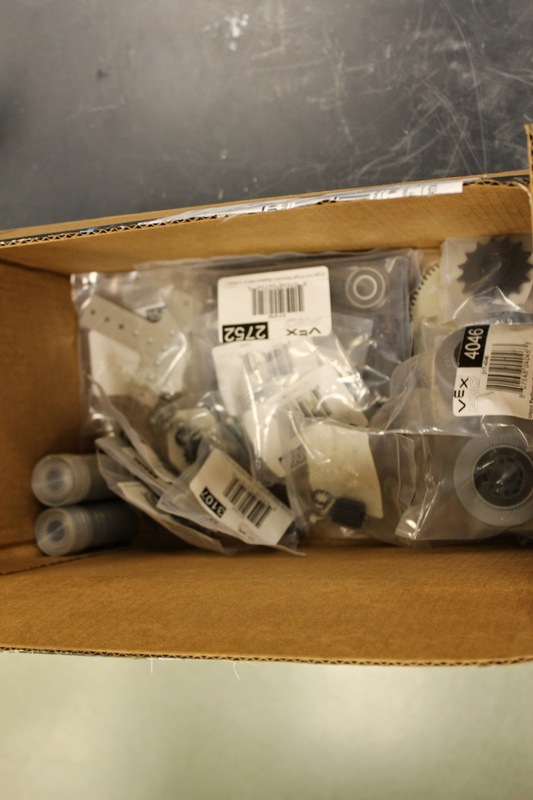 Our VEXpro order came in today that included our drive gearboxes, and some other parts of our chassis. We also started using our new router more to help with the chassis gussets and also the belly pan. This year we are using a 1/4" Baltic Birch plywood belly pan. We bought the plywood from Clark's Hardwood here in Houston. 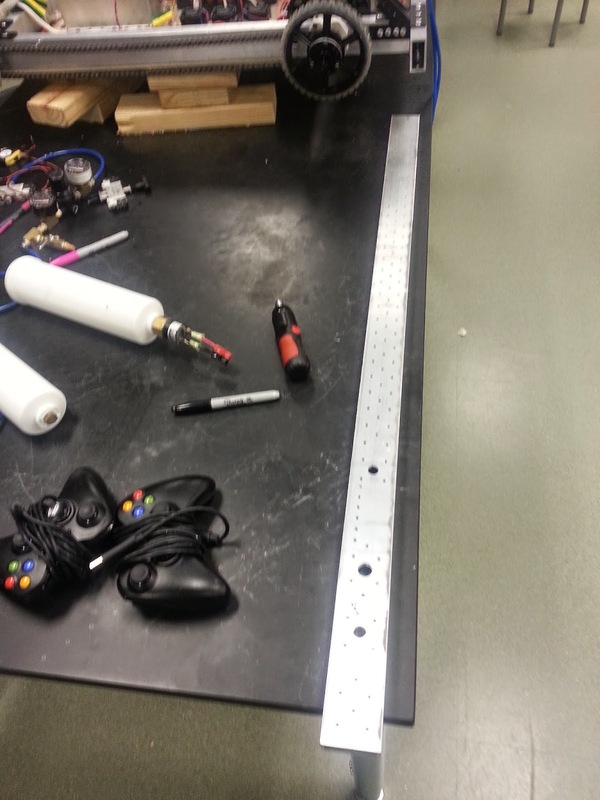 We fixed a few things with the prototype robot, but most of the day was spent CADing. 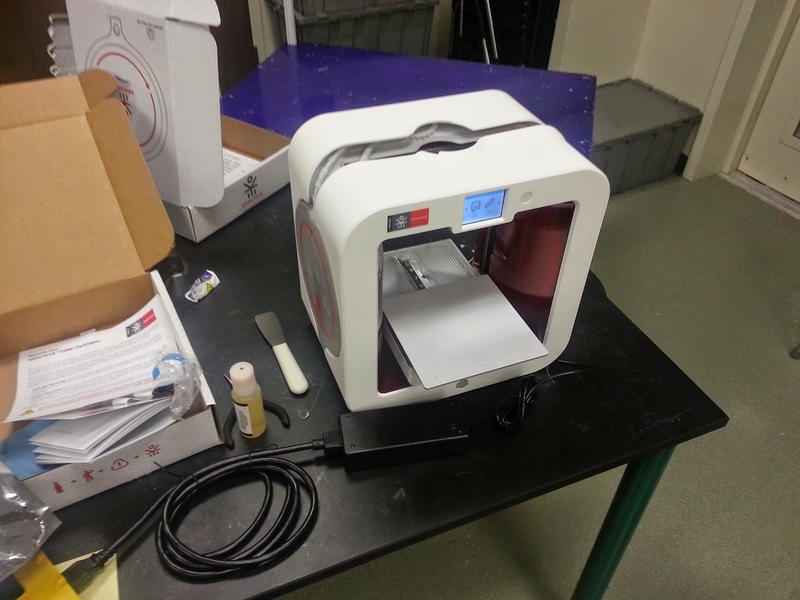 We also have our 3D printer making very accurate parts out of polycarbonate filament (Lexan). This part is piece for our four bar that will allow us to tilt back the totes and recycling containers while we are carrying them. We should be getting drive train components in the next couple days so robot progress will speed up then. We're into Week 2 and we have started finalizing our designs. We tested out an option to lower only a single wheel to allow us to strafe and it looks like this will work for us. We aren't planning to strafe very often, only for small adjustments when stacking and for autonomous. This means we didn't want to dedicated a ton of space or weight to make it work. The plan is to use the same 2+2 drive train we've been planning but also having a drop down 2.5" Colson wheel between the two front wheels. This small wheel will drive us sideways in an arch, to counteract the arc we will have our rear omni wheels turning at the same time with feedback from a gyro. This will compensate for the rotation and allow for short bursts of horizontal travel. 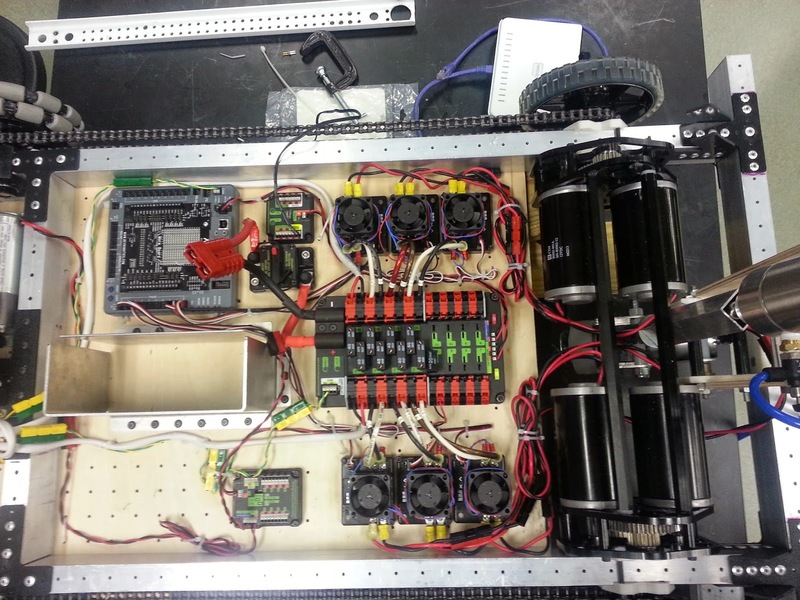 If you haven't already check out the work of the VEX staff on their Build Biltz project. They just posted a couple great guides on building drive trains and claws for Recycled Rush. Also remember to continue reading the Q&A and check the team updates every Tuesday and Friday. Sorry for the delayed post, we had a long weekend. 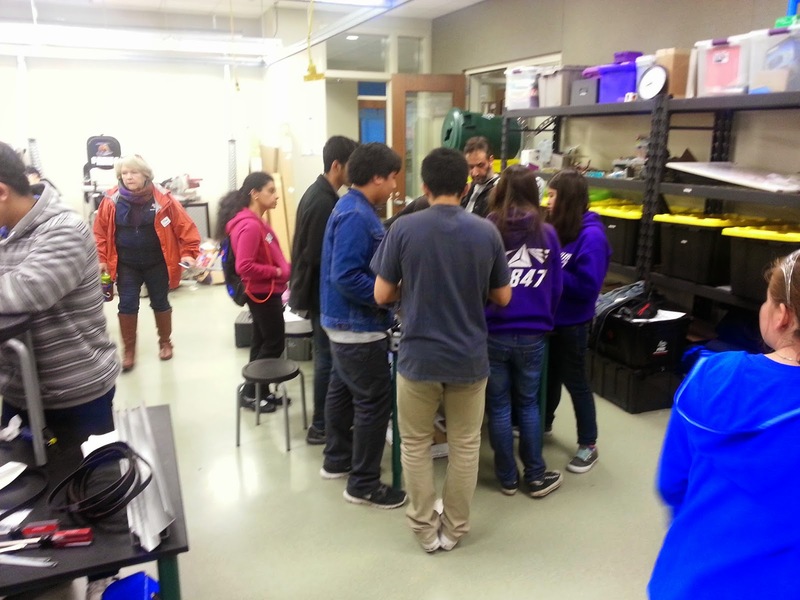 Yesterday we opened our lab to 6 other local teams so they could collaborate with us as we all worked on our robots. We had four rookies teams with us 5416 from Katy Taylor, 5427 from Katy Tompkins, 5566 from Sugarland, & 5769 from Santa Fe High School. It was great to see these young teams just getting into FRC. 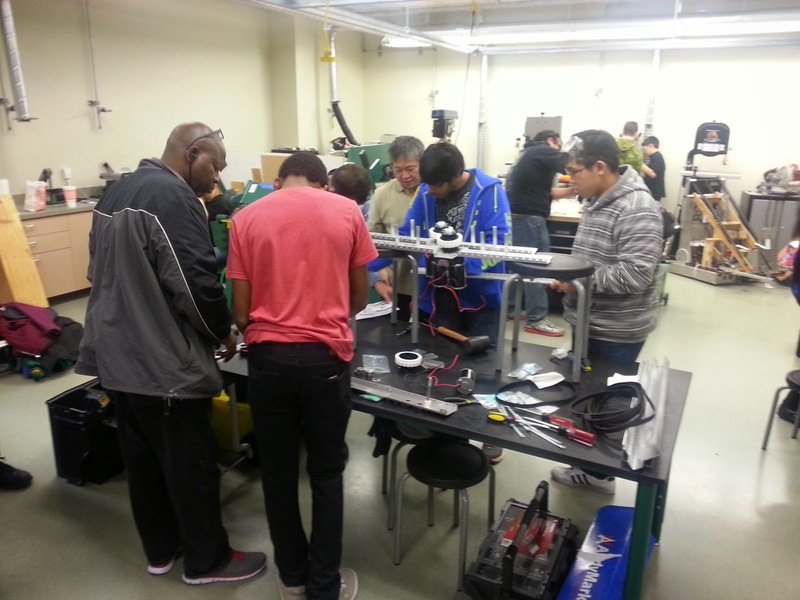 We helped them learn the ropes and put together their AndyMark AM14U2 drive trains. We also did an electronics demonstrations and guided them through the new control system. We'll be holding another collaborative build session on Sunday Feb 1st. One thing we concentrated on was our lift and end effector. We attached the pneumatics to our prototype for testing and should have some of the new active features ready to be tested this week. We're a little behind in CAD this year, there are a lot of design decisions to be made since there are so few constraints this year. It's much harder to choose a chassis size when you have close to unlimited options. Every little decision we make now will have ramifications later on in build season. We made progress on some of our prototypes today. We added a tilt to the lift to aid in the lifting and releasing of the totes. Hopefully, this will speed up the stacking process a bit. 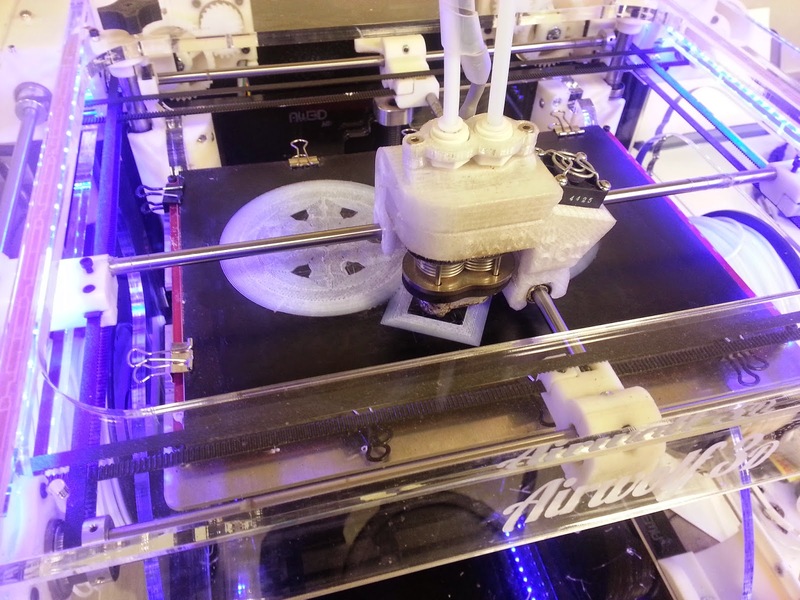 We also 3D-printed a hinge that will help with stacking. This hinge presses on the bottom of the totes while they are lifted, supporting them, but moves out of the way when the lift moves vertically against a stack. We hope to record a video soon that will clarify the design and use of this part. We're also developing the pneumatic system needed to control the lift. However, we still have quite a bit of work ahead of us in order to improve things like tote alignment and speed. This prototype can extend and retract a measuring tape with the intention of pulling a tote with the hook on the end of the measuring tape. We are working on building a pivoting hook that can grab the lip on the top of the tote and pull it. In this design, the hook falls onto the tote when the bottom of it presses against the tote upon robot collision with the tote. The hook disengages when the robot backs away slowly from the tote. We still have a ways to go on building this one, but hopefully it will be useful during gameplay. "How does a project get to be a year late? … One day at a time." We worked out a few more iterations and developments today but made no major changes. We started looking at quick ways to drag totes from the landfill. We could use our lifting mechanism, but speed may be crucial once game play prioritizes the race to get to the recycling containers. The tasks that are important to a single robot aren't always those that are important to an alliance. This may be like the human player pass back last year; it didn't directly give an alliance points, but it had the potential make or break its strategy. Most of the day was spent reworking the dimensions of our frame and 4-bar. We realized it would be beneficial to have a long, narrow robot this year. A long wheel base would make a robot more stable when carrying the weights of totes and containers on its lifting mechanism. A narrow track (the distance between two wheels sharing an axle) would allow a robot to navigate more easily through a congested field. We are currently looking at a frame size of 24-27" x 36-38". 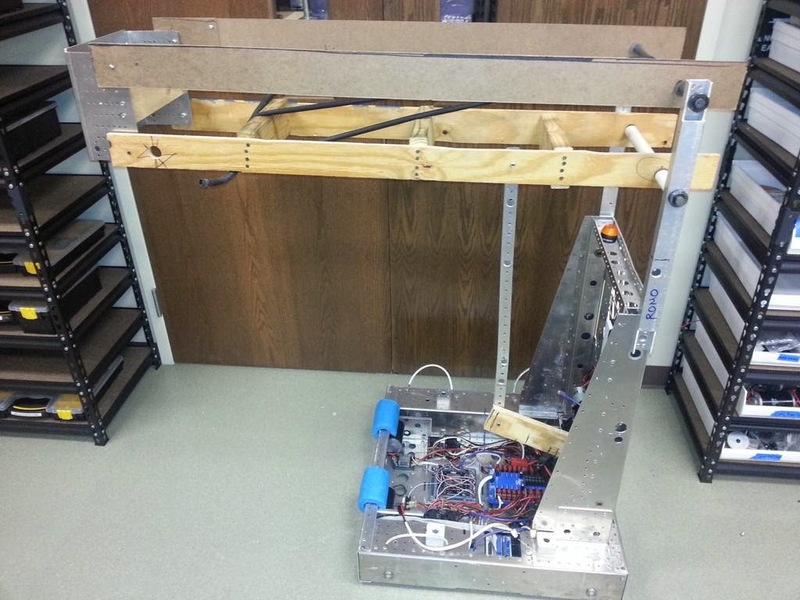 A 28" x 38" robot was the common frame size before the 2013 frame perimeter change. It worked very well in FRC for a long time. Our frame dimensions directly affect the length and heights of our 4-bar mechanism. Our current goal is to be able to elevate 4.5 ft, enabling us to place a tote on a stack of 3 already on the step and helping us to earn Coopertition points. Reaching this height would also allow us to place a Recycling Container on a stack of 4 totes on a scoring platform. So far, this seems like the most reasonable plan. This would allow a team to contribute to a high scoring alliance or to score highly if carrying the majority of its team's scoring load. For example, if a team is allied with two robots that cannot lift game objects, its allies should be able to push stacks of two totes from the feeder station onto the platform. Afterwards, the team could combine those two stacks and place a Recycling Container on top of them for additional points. While achieving our 4.5 ft. elevation, we also want to minimize the distance our arm travels past our frame perimeter to keep us more stable. This is the CAD sketch we have been using to calculate the length and heights of our arm segments. 2D CAD like this can be extremely helpful during prototyping. This sketch shows that we currently will push out from the front of our frame about 9.31". We are continuing to iterate on our hook mechanisms. We have tested several passive hooks that can grab totes and recycling containers and are working out how to do this most reliably and efficiently. We haven't ruled out an active mechanism, but we would like to solve the problem in the simplest way and believe that this may be a reasonable solution. We have started adding photos to our Flickr page. Please leave any questions or suggestions you have in the comments below. If you think we are heading down a bad path, please let us know; we are always open to suggestions for improvement. “Perfection is achieved, not when there is nothing more to add, but when there is nothing left to take away." Most of today was spent working on the 4-bar prototype. This design was inspired heavily by FRC#148 The Robowrangler's 2011 robot Raptor. We didn't get it powered on today, but that should be the first thing we do tomorrow. The current version (as pictured) is too large for our actual needs. Even if we lower the pivot points and shorten the arm, we are still able to reach the height limit of 6.5'. 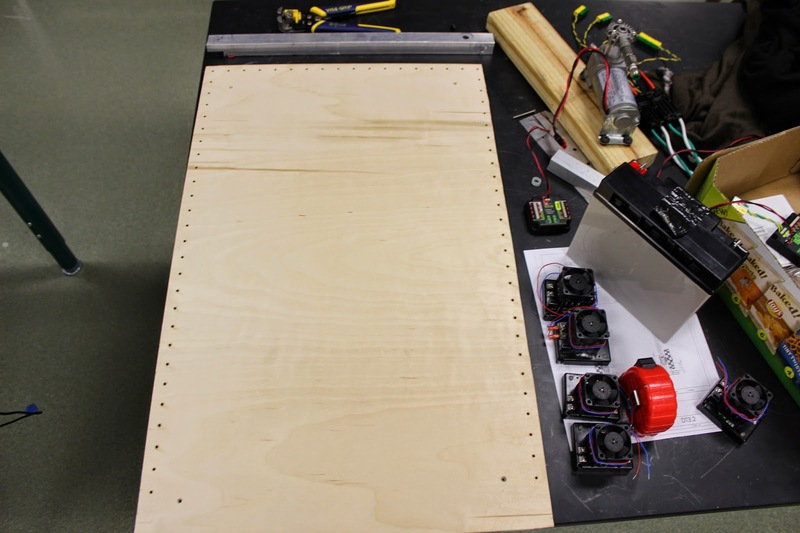 The prototype is made of plywood, 2x4s, hardboard, and some extra metal pieces from old robots. We improved the CAD of our proposed drive train. Our current idea gets its inspiration from forklifts and their ability to steer from their rear. All 4 wheels will be powered, but we are hoping to pivot mostly over the front traction wheels. 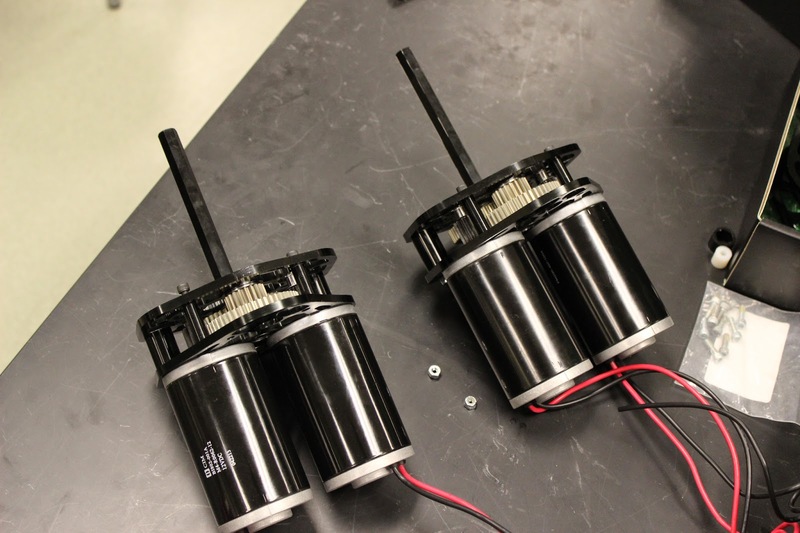 We have thrown around the idea of having a drive train that is able to drive sideways, and, although we haven't ruled it out, the simplicity of a drive train like the one pictured is very appealing. We will continue working on iterating collector prototypes this week. 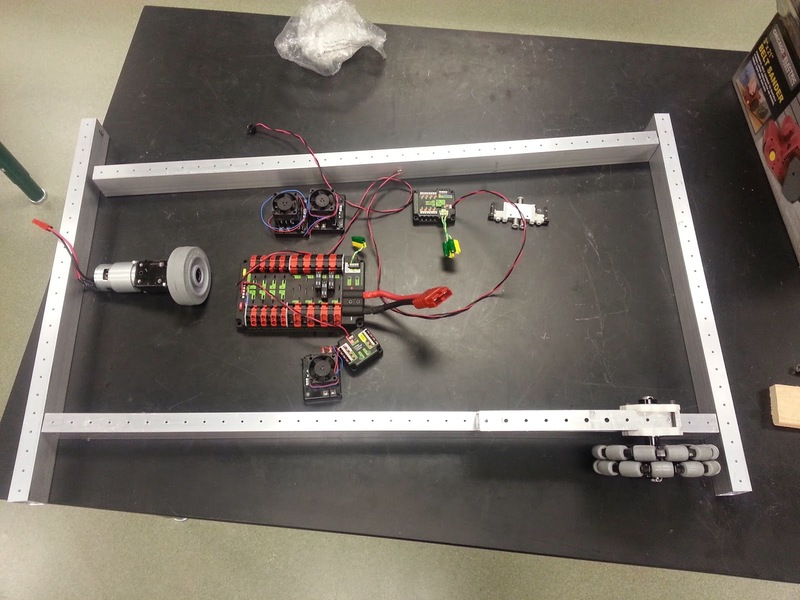 We will also work on some programming tasks, including finding a sensor-based solution to aligning the robot to a tote. Our idea uses two range finders to get the distances of the left and right sides of the robot from the tote and has a control loop set them to be equal. We hope to test this by the end of the week. Lots of good work is being done, but now we are working on finding any little details that might help us speed up our scoring. One of today's ideas was for the robot to be able to set a tote on top of a stack, lower its arm, and lift the stack -- all while remaining stationary. This an ambitious feature, but it would allow much faster and more accurate stacking.